On a very popular blog that I visit, there has been considerable discussion surrounding a post about the Christian nativity story (over 400 comments to date). Initially, most of the comments were related to the core subject, but as so often happens, contributors began to gradually move away from the primary topic. Before long, the “side discussions” took on a life of their own. The topic that seemed to get a lot of attention was the historicity of Jesus. Was he simply a Jewish preacher who followed John the Baptist and then inspired his own small following? Or was he more than this as (supposedly) proven by his death and resurrection? Or did he exist at all? If one were to consider the New Testament a work of fiction, is it not possible the person of Jesus could be a made-up individual? Those who wrote about him could easily have based his character on the Hebrew bible. Nan, I do think certain elements of the stories are definitely borrowed from the OT, like the 3 days in the grave being similar to the Jonah story. And the flight to Egypt to avoid infanticide being a repurposing of Moses. But where did the other elements of the story come from? What would a scam artist have to gain in making up a character like Jesus? On the other hand, what if there was a Jewish preacher named Jesus who was trying to understand how God could have a kingdom and how the Jews could still be his people despite their sad history of occupation? Might this preacher begin to think that God’s kingdom was spiritual rather than physical? He gathered followers (as any charismatic individual always does), and these followers simply couldn’t believe that he had been killed, etc, etc. The thing is, we have several different, independent sources for this individual: Paul, gMark, gJohn, Q, gThomas, and possibly others (this is not an area I’ve researched in-depth). These writings were obviously reliant upon oral traditions, which would have been passed down by the earliest Christians. How did this early group form? To me, it makes sense that it probably grew from the handful of believers who actually knew a preacher named Jesus. Without an historical Jesus, we need a single individual who created the core story and somehow convinced some people to believe him. That’s certainly possible — I just don’t see how it’s more probable than the existence of a person named Jesus. The hour was comparatively late when this exchange took place, so I deferred posting a response, preferring to wait until morning when my mind was fresh. When I checked the blog the next day, none of the participants had responded to this brief discussion but instead had returned to the prior day’s discussion. I decided I wanted to delve a bit deeper into my “theory” so I’m writing this post. We know there were apocalyptic writers during the “Silent Years” (between the end of the “Old Testament” and the beginning of the “New Testament”). We also know they wrote some pretty fantastical tales (especially about “hell”). While these stories didn’t make the cut for the “New Testament,” who is to say the stories that were included are any more factual? All the gospel writers were Jewish so they knew their people had been waiting for the mashiach, the individual specially appointed and empowered by God to usher in an era of peace and prosperity. How can we know for sure they didn’t “create” Yeshua? They could easily have used stories from the Hebrew Bible to convince the people of his authenticity. Using their imagination, they could paint this person however they wanted … as a miracle worker, a healer, someone with special insights. Why, they could even have him die on a cross, be buried, and then be brought back to life by Yahweh! What other proof would the Hebrew people need to know he was God’s chosen Leader for the last days? Let’s say the first writer (we’ll call him “Mark”) started out with a rather modest version of this individual. Then other writers decided to expand on the story, adding details and intriguing incidents to make the tale more interesting. Since each person’s style of writing is different, the narrative became more and more detailed and, well, embellished. Then, to provide his readers with a smashing finish, one of the writers decided to add another dimension by having this fictional character die and then return to life! Other writers followed suit, adding their own details to the event. In fact, one of the writers decided to give his story a dramatic ending by having this individual ascend into the “upper heaven” to be with Yahweh. Not surprisingly, this created individual soon became the topic of conversation (similar to popular fictitious characters in our modern world, e.g. Harry Potter, Batman, Luke Skywalker, etc.) This prompted other writers to get in on the action and before long, more “books” came out. One individual in particular took on the task of turning Yeshua into a revered individual … to the point that groups began to form and hold get-togethers to talk about him! In his comment above, the blog owner asked, What would a scam artist have to gain in making up a character like Jesus? Perhaps these individuals were not so much “scam artists” as they were imaginative individuals who simply wanted to give their people hope. Or maybe they were like many today … people who simply wanted to get in on the action. This may all seem too far fetched to be possible, but since there is absolutely no proof that the person of “Jesus” even existed, how can anyone state with absolute certainty this scenario doesn’t have merit? Fiction or non-fiction. That is the question. OMG! Don’t Open the Door! Satan May Be on the Other Side! From my own experiences, I know there are people who sincerely believe in the accuracy of this list. 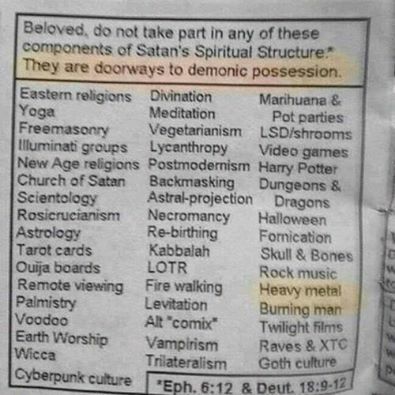 In fact, during my time in Christianity, I was cautioned against several of these activities. But c’mon … Yoga? Vegetarianism? Meditation? Video games? Harry Potter? If there’s anything I learned as a result of walking away from the church, it’s that Satan does not exist. Most believers are unaware that the concept of an “evil one” was developed by apocalyptic writers during the “silent years” (the approximate 300-400 year gap between the end of the Hebrew sacred writings and the appearance of Jesus). This was when the Jewish people were experiencing the tumultuous times of the Babylonian captivity, the Persian and Greek takeovers, the unholy desecration of the Jewish temple by the Greek ruler, Antiochus Epiphanes, and the oppression of Roman exile. Little by little, these imaginative writers began to develop a “cosmic entity” (based on myths from surrounding cultures, as well as “otherworldly visions”) that could be blamed for all the bad things that were happening. Interestingly, while Satan (or the Devil) is mentioned in the New Testament – according to one source no less than 568 times – no one talks about where he came from. He just appears. But then, there was no need because for the past several centuries he had become a very popular, albeit malevolent, figure among the Jewish people. To this day, Satan continues to be a very hot topic. He’s frequently mentioned in movies, books, and on TV. And look, someone has even published a list to prevent anyone from opening the doorway to this very bad guy. P.S. You can read more about Satan and his beginnings in my book, Things I Never Learned in Sunday School.